What is Contemporary Bathroom Design? What is Traditional Bathroom Design? Whether you decide to renovate your master bath simply to update the plumbing and the porcelain fixtures, or, perhaps to include some exciting water features, you are not alone. 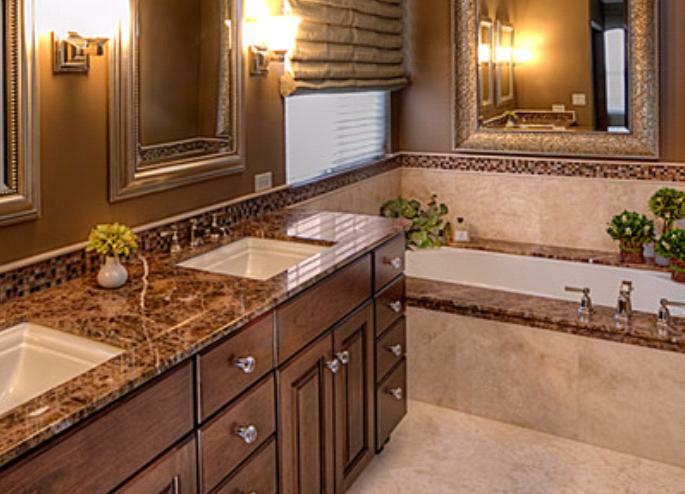 The most popular interior remodeling project is the bathroom. It is also considered the most obvious renovation in the house… just a few tweaks can turn your bathroom from blah to beautiful. Today’s contemporary bathroom is all about the here and now and reflects the latest design fashions and trends, whereas the classic or more-traditional bathroom is a much more subtle and elegant design and one that has an almost calming effect. The concept of a room devoted solely for personal hygiene dates back as far as 3000 B.C. In fact, the third millennium B.C. was referred to as the “Age of Cleanliness” – this was in part because water had a religious value, its purpose was the purifying element for body and soul. Fast forward many years, and, of course, we find water is just as important to cleanse the body today. The cleansing of the soul might just be accomplished by the various water features available which aim to relax and de-stress the people who use and enjoy them. As an example, who would not to end their stress-filled day with a quick soak in the Jacuzzi or enjoy a hot sauna bath? And, if lack of funds, or space available to acquire such amenities, becomes a deterrent to turning your bathroom into a paradise, the next best option is one of many types of showerheads with pulsating streams that will pound away the cares of the day, as you watch them swirl down the drain. It’s a quick fix of course, but does the trick. First we should define what contemporary bathroom design is. Rather than your bathroom being a standard, run-of-the mill design, it is, instead, tailored to the individual’s needs, wants and desires. The bathroom is what you make it – and through a contractor, whose expertise is in home remodeling right here in the Doraville area, your plain bathroom can become a sanctuary with as many amenities as the room is able to accommodate, and you are able to afford. A contemporary bathroom does not consist of a sterile-looking environment, blah or nondescript wall colors, but instead is vibrant and speaks to your personality. Be prepared to find such shades as avocado green, or the popular duo of chocolate brown and pinks reminiscent of the 60s and 70s, but today used in a more chic and harmonious fashion. While you won’t find curtains adorning the windows, you’ll find instead window treatments in mediums in vivid colors and rich-looking textures in fibers like linen, jute, silk or wool. 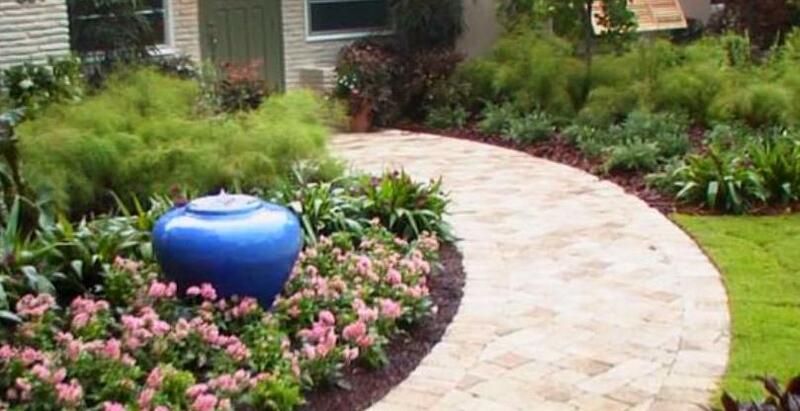 Similar textures and complementary colors will be found in the wall and floor treatments as well. Complementing the rustic or back-to-nature trend that is popular in contemporary bathrooms, one might find natural wood finishes out of the renewable resource bamboo, which may comprise vanities, floors and blinds. Just because natural-type textures are often prevalent, it is also trendsetting to use manmade materials like metal, concrete, vinyl or colored glass, like mosaic, in the contemporary bathroom. Contemporary bathrooms may feature a custom vanity or sink with natural stone counters and primo-looking fittings and fixtures in polished or brushed finishes… all part of the “wow factor” and all guaranteed to add some “bling” to the bathroom. Wall tiles are not just some hum-drum, ordinary-looking ceramic tiles, but are often custom made, incorporating a wide variety of materials and in unique designs that are cut precisely through the use of water jets. And, if you thought a wall-mounted toilet was a radical concept for trimming up the space that this porcelain commode generally encompasses in the bathroom, why not kick your toilet up a notch by getting a self-flushing model with a heated seat? 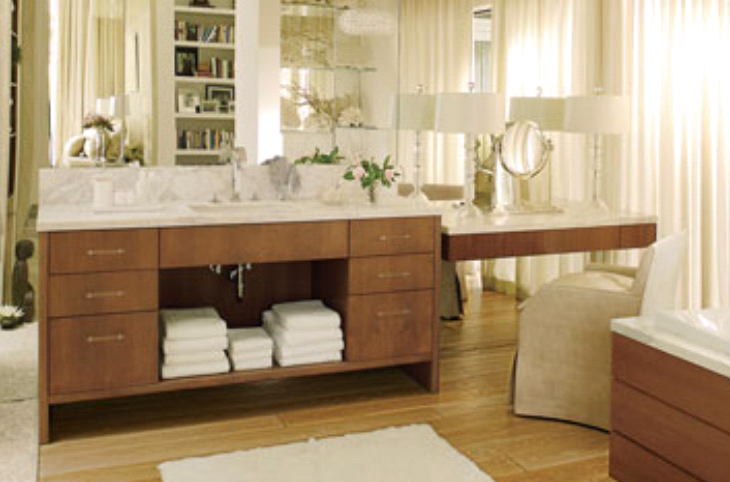 The amenities are endless – the treats to pamper yourself in this bathroom paradise could fill a page. It is much more than simply pulsating showerheads these days, because with a little ingenuity and an expert bathroom remodeling contractor in Doraville, you can have a steam shower, maybe a sauna, or even a whirlpool in your own house. Go ahead and soak away your troubles in an oversized soaking tub, while watching the TV. on a waterproof monitor. And, though the temps in Georgia could hardly be called cold or chilly, why not treat your tender tootsies to a radiated floor or bask in the heat of infrared sensors? All of these modern amenities and devices are not only a contemporary design, but are created by manufacturers who are ever-mindful of the environment, and create them to conserve energy and water. Finally, contemporary design in the bathroom is much more streamlined – you won’t find bottles and cans of toiletries lining the natural stone vanity countertop, but instead they are neatly tucked away out of sight giving a less-cluttered look and minimalist look to the room. If these ideas appeal to you and a master bath renovation is on the horizon for your home, why not consult a home remodeling contractor here in Doraville today?